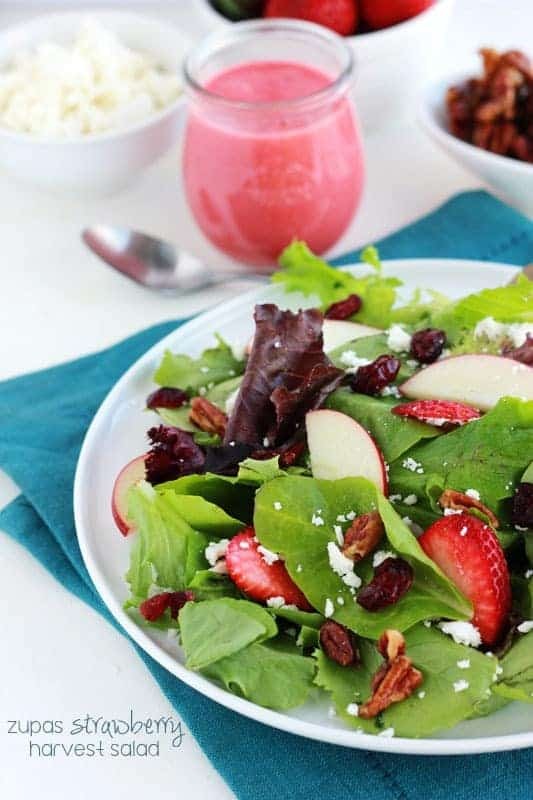 This tasty salad recipe is inspired by the Strawberry Harvest Salad at Zupa’s! Filled with berries, candied pecans, apples, and topped with a sweet strawberry champagne vinaigrette! The very first time I ever visited Zupa’s was with one of my first roommates. She raved about their soups, salads, and sandwiches and finally convinced me to meet up for lunch. I got soup and a sandwich but could not stop staring at her Strawberry Harvest Salad. All of the ingredients in this copycat recipe, from the candied nuts to the salty cheese, work beautifully making this a salad you can enjoy over and over! Start with a variety of greens. You can find a bag of salad ready mixed greens at most grocery stores. We like to make our own with a combination of romaine, ice burg, spinach, and arugula. Add texture with a variety of mix-ins. Nuts, fruit, vegetables… You can elevate your salad by tossing in handfuls of your favorite ingredients. Make your own salad dressing. Homemade vinaigrette, ranch dressing, or a balsamic gives your salad life and flavor! Do not skip the salt and pepper! Make sure you season the entire salad with a little salt and pepper OR other seasonings. Mix in a salad bowl before you serve. I opted for feta cheese instead of fontina. I feel like it adds just a touch more flavor but it is definitely a personal preference. You cannot go wrong either way. Oh-my-heavens- does it taste good. 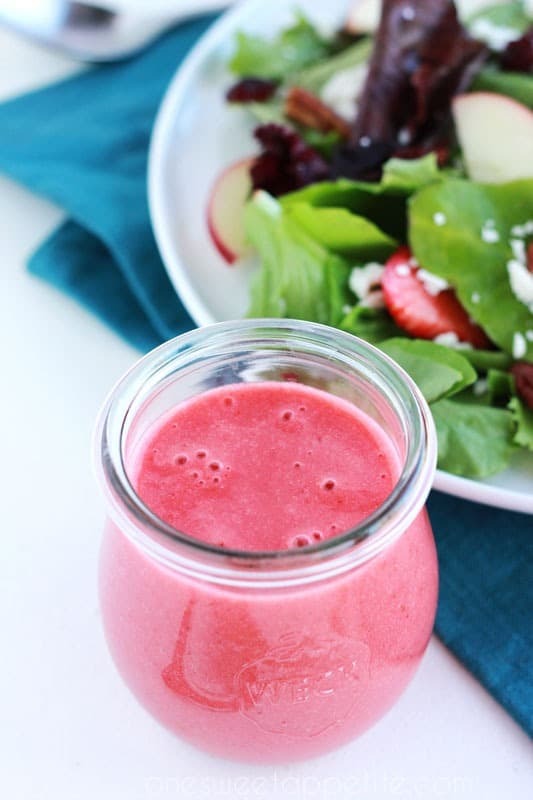 Combine thawed frozen strawberries, lemon juice, sugar, champagne vinegar in a high powered blender. Blend smooth. Add a bit of olive oil and pulse until combined. This salad really makes a fantastic meal. We have had it for both lunch and dinner. 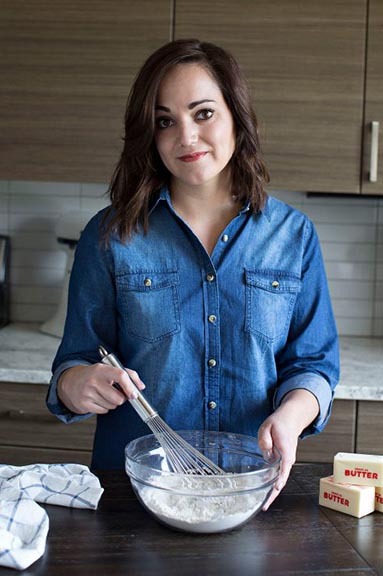 The addition of so many great ingredients helps fill my belly and keep me satisfied longer. I also tend to reach for it when I have a little bit of a sweet tooth. Fresh fruit takes this salad to the next level! 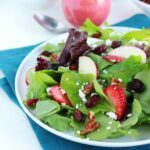 This tasty salad recipe is inspired by the Strawberry Harvest Salad at Zupa's! Filled with berries, candied pecans, apples, and topped with a sweet strawberry champagne vinaigrette! 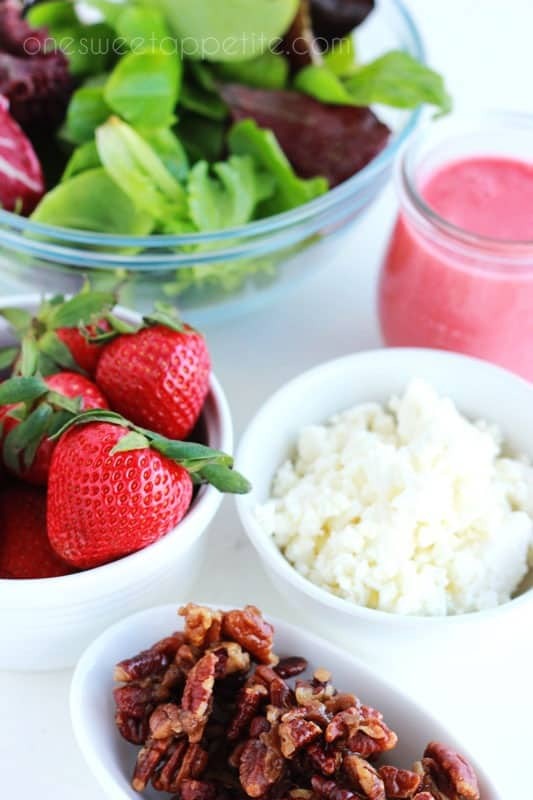 Toss the mixed greens, strawberries, feta, apple, cranberries, and pecans in a large bowl. Serve with Strawberry Champagne vinaigrette. 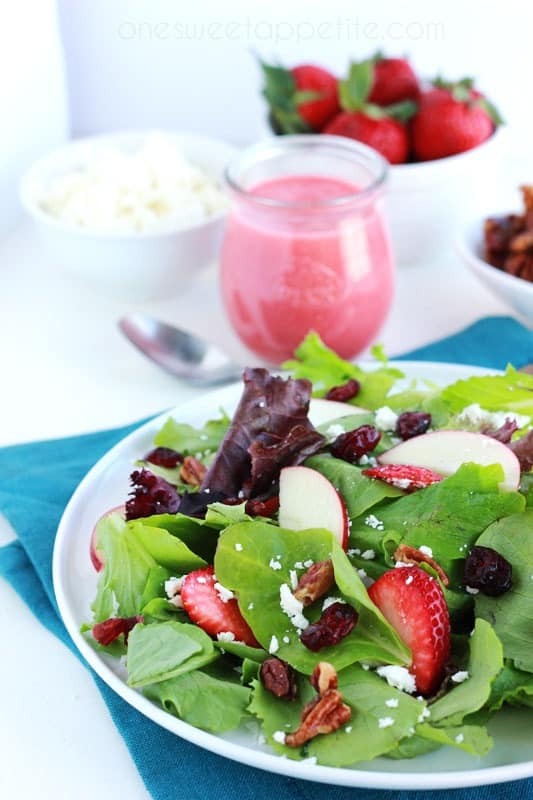 *Get the candied pecan recipe here and the strawberry champagne vinaigrette here. 2004 & Barling. IGF-1 Serious Growth Factor Deer. I love your zupas strawberry harvest salad but I can’t find the dressing that goes with it. This recipe is worth its weight in gold! It’s my new favorite everything. Thank you!! Rice vinegar worked well for me in the dressing – since I couldn’t find champagne vinegar. Yay! I love comments like this one. We love that dressing too. I haven’t made it with rice vinegar but will give it a try! I’m not really sure. I’ve seen some calorie counters online that I’m sure could help you figure it out. I’ve not heard of Zupas, but when’s saw this salad I had to try it. I used olive oil and balsamic vinegerrete (which is wonderful) and got all the ingredients together in separate containers as not everyone in my house likes all ingredients and they chose what they wanted and yum!!! Wahoo! Glad you loved it! The cheese is not feta at Zupas. Do you know what it is called? I believe they use fontina cheese.